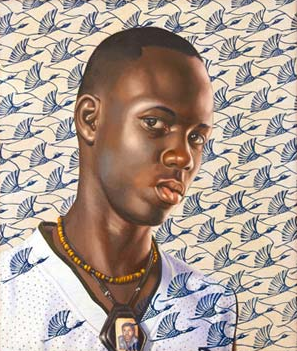 Kehinde Wiley is one of the most successful young artists on the scene today. His work shows a distinct interest in patterns, and serve as yet another example of the intersection of wallpaper and fine art. Wiley is known for portraying modern African American men in heroic portraits, often overtly referencing masterpieces of the Western cannon. I am struck by how he uses colorful, graphic patterns to balance the strongly portrayed figures. It's almost as if he uses wallpapers as backgrounds for his subjects, removing them from ordinary space and instead placing them with abstracted, fantastic backdrops that express their strong, vibrant, youthful personalities. Kehinde's color pallet is bold, his patterns engaging. Amazing, amazing work.